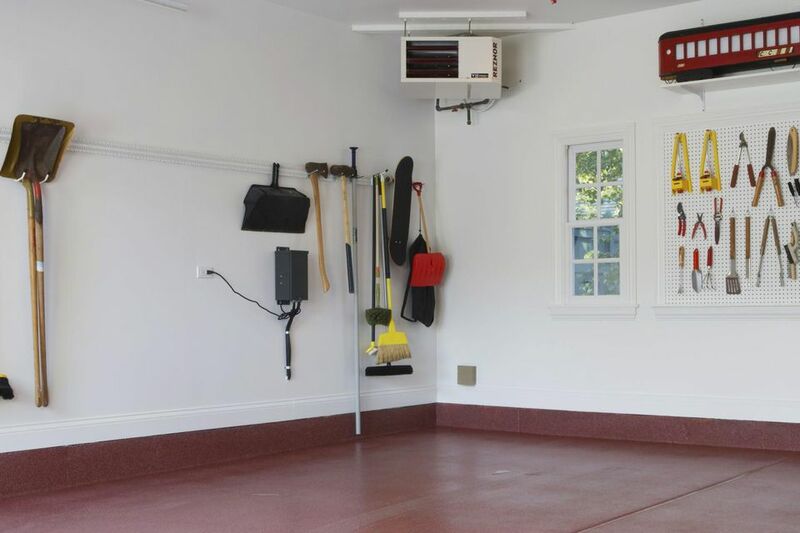 Most garages seem to get a lot use in warm weather, but are often sent into hibernation for the winter. If you would like to spend more time working in your garage in cold weather, here are some affordable heating choices worth investigating. Windows. In a garage that will be heated in winter, make sure the windows have the same insulating value as you would use for your house. Double- or triple-pane insulated glass filled with inert gas is the best choice. Energy-efficient garage door. Steel, aluminum, or fiberglass doors with polyurethane foam inside will have the best R-values (the resistance to energy loss). For example, 1 3/8-inch-thick polystyrene foam carries an R-value of 6.5, compared to a plain wood door that usually has an R-value of 4 to 5, but polyurethane foam doors have an R-value as high as 20. Most experts suggest that a garage that will be heated should have an overhead door with an R-value of 10 to 12, minimum. Seals along bottom and sides of the door. Drafts are main source of energy loss, so make sure the weatherstripping along the bottom of the main garage door is in good condition. Also check the weatherstripping on passage doors and windows. Insulate outside walls. A garage that will be heated and used in winter deserves the same fiberglass batt insulation that is used in your house. Consider finishing the ceiling. Many garages have open rafters and trusses overhead. Minimize heat loss by insulating the spaces between rafters and trusses and finishing the ceiling with wallboard. Freestanding space heaters burn kerosene or propane are portable and inexpensive, but they are only useful for heating small spaces. Unvented kerosene and propane space heaters can boost the temperature in a small garage, especially if it is insulated, but they also release carbon monoxide and moisture into the air. Be very careful when using a freestanding liquid fuel heater in an enclosed space—many safety experts frown on the practice. Direct-vent space heaters, on the other hand, can be great choices for supplying heat to the garage, especially if your house is already piped for propane or natural gas that runs your furnace, stove, or a gas fireplace. Direct-vent garage heaters exchange combustion air and exhaust fumes through a pipe in the wall, thereby eliminating carbon monoxide danger. If you plan to use the heater frequently, look for a model with maximum efficiency. Suppliers of direct-vent heaters provide instructions for installing the unit yourself, but even if you feel up to the chore, it's best to have a professional install the gas line. Direct-vent space heaters are perhaps the best choice for a garage in a cold climate that needs to be frequently heated or kept at a constant above-freezing temperature. A wood stove can be a great choice for heating the garage under certain circumstances—especially if you have a steady, inexpensive supply of wood for fuel. Using a wood stove comes with caveats, however. You will need to have room for a safe installation, with proper clearances between the stove and any combustible materials. And all wood stoves must be connected to proper chimneys. A wood stove takes quite a while to heat up and will continue generating heat long after you’ve stopped feeding it fuel, so this is not a good option for short, quick heating needs. A wood stove can be perfect, though, for day-long projects in the garage. A woodworker with lots of scrap lumber on hand might find a wood stove to be a perfect solution. Caution: Never burn pressure-treated lumber or scraps of sheet material with chemical resins in a wood-burning stove. Burning these materials produces toxic fumes that by law cannot be sent into the atmosphere. Electric heaters suitable for heating a garage come in many forms, from small 120-volt portable plug-in heaters to 240-volt radiant overhead heating units, to permanent baseboard heaters. The main virtue of electric heaters is their convenience. Electric heaters are quiet, clean, and unobtrusive, they do not require that you tap into a furnace or boiler, and they require no chimneys or vent pipes. Electric heaters are generally inexpensive to purchase and install, but they can be fairly expensive to operate on a constant basis, especially in very cold climates. In cold climates, it may be best to fully insulate and weatherproof your garage if you want to heat the garage frequently with electric heat. Electric heaters are ideal in more moderate climates where subfreezing temperatures are rare. Convection heaters are classic space heaters that warm the air in a room and circulate it due to the natural effects of convection currents that cause warm air to rise and cool air to fall. There are many styles of convection heater, from electric baseboard heaters to portable plug-in radiators that are filled with oil. They are relatively safe heaters to use, especially when equipped with an automatic shut-off feature that kicks in when the heater tips over. Ceramic heaters fall into the convection heater category. Radiant heaters heat objects in their vicinity, including people, but they don't specifically heat the air. This is a good choice if you want heat quickly, but they are a bit risky since they can burn people or pets, and pose a fire threat if they are operated too close to flammable materials. Combination heaters combine the virtues of both radiant and convection heaters, by using a fan to distribute the heat produced by radiant coils. It is also possible to extend the system by which your central furnace and air conditioner heats and cools the rest of your house by adding ductwork into a garage that is attached to the house. However, this can dramatically change the load on your HVAC system, so it is best to have professional assess the situation and run the additional ductwork if you choose to go this route. If your furnace has the capacity to serve the garage, this is may be the most effective long-term solution to your heating problem. Make sure, however, that you have taken all measures to insulate and weatherproof your garage.